This is going to be a couple of posts long in order to achieve the dialogue I am longing for. I’m hoping that over the course of the next couple of days, we can explore the lasting effects of the War of 1812. The War of 1812 is so often overlooked in American history that it leaves numerous open ended questions. One of those being: why is the war important at all? To answer that, consider a more recent event. On September 11, 2001, middle eastern radicals attacked the United States by flying planes into the World Trade Center towers, the Pentagon, and a failed hijacking that crashed in Pennsylvania. After this event, Americans came together and resolved to bring those attackers to justice. Most houses flew the American flag out front, even though it wasn’t July 4th, and rhetoric from the government and prominent figures enticed the American spirit. One word comes to mind that describes this nearly dramatic support of one’s country; patriotism. So why is the War of 1812 important? 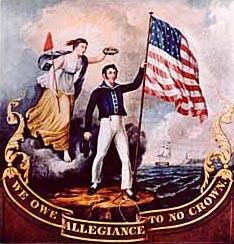 Perhaps the War of 1812 created the American patriotism that exists even today. Next Happy Two Days After Independence Day!!!! The War of 1812 is not forgotten by Canadians. The US invasion may have also given birth to Canadian patriotism. No but to Americans it is overlooked. How can we make the argument for the creation of Canadian patriotism? It seems awfully British to me. I’d argue that Canadian Patriotism comes from their rebellion in the 1830’s. I have a pal at work whose family has served the British Crown as soldiers and sailors since 1680 and he tells me that the War of 1812 is pretty huge to Canadians…they see it as their heroic men (and Laura Secord) saving their new and thinly-populated country from invasion. Which is why their bicentennial commemorations of it have been greater than American commemorations.